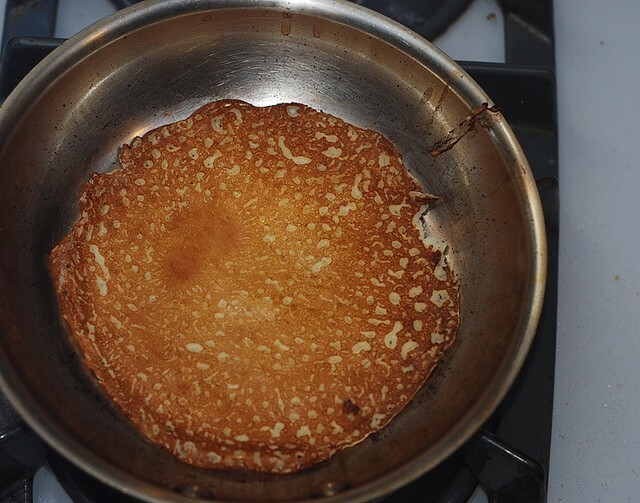 This is my time tested recipe for how to make crepes in a regular skillet, from scratch, at home. Step-by-step photos and instructions on everything about crepes: how to make crepe batter, how to flip crepes, how to make sure they don’t stick to the pan, etc. Easy crepe recipe for French-style crepes! Because I make the crepes so often at home, I became somewhat of an expert in my family on how to make crepes, and mind you, being an expert in crepes does not amount to many privileges here, except for the privilege of making lots of crepe batter and practicing flipping them (the crepes) on a frying pan. I literally could flip them with my eyes closed. 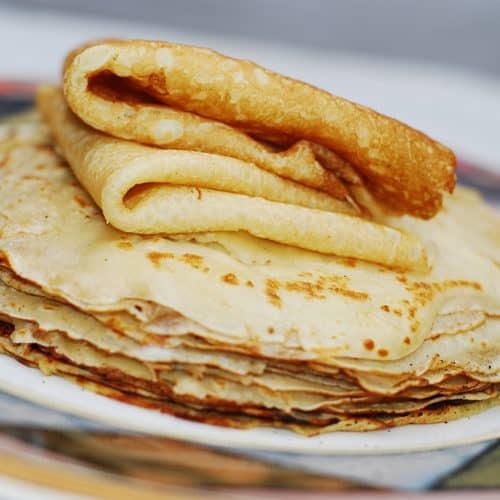 The easy crepe recipe I have below is for classic French style crepes: thin, slightly sweet, perfect for all kinds of delicious crepe fillings! Crepes and I go back together long ways. You see, I grew up eating crepes on a weekly basis: my mom would usually cook them during the weekend, and my sister and I would eat them for breakfast, almost always with home-made sour cherry preserves. The sour cherry preserves were prepared by our parents during summer, with cherries from huge sour cherry trees in our garden. My sister and I would pit the cherries. 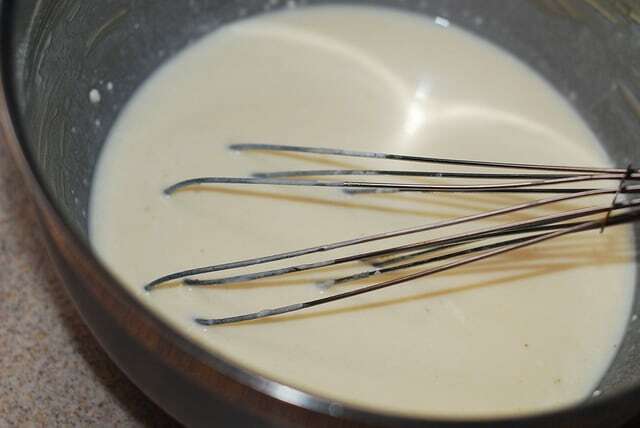 And, yes, the crepe batter recipe and the process of making crepes are so easy. 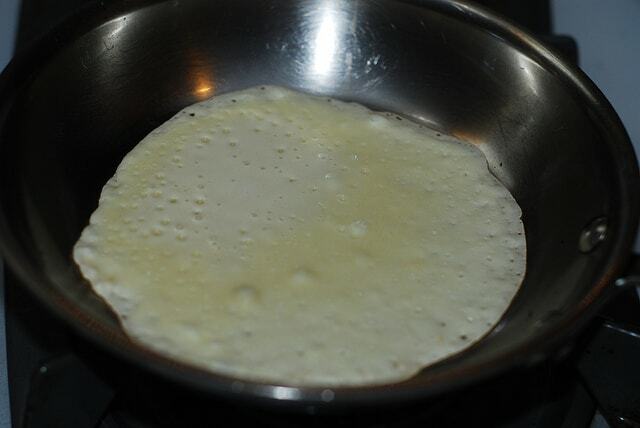 In fact, the only “hard” part is using the right frying pan and a little bit of practice to flip the crepes. If you never made crepes, I highly recommend using non-stick pan, which will virtually guarantee that crepes won’t stick to the pan. I personally like to use stainless steel skillet, as it results in a much better crepe texture, but using stainless steel will require some practice (as far as how hot you need to get that pan to make sure crepes won’t stick). With non-stick, it’s easier. 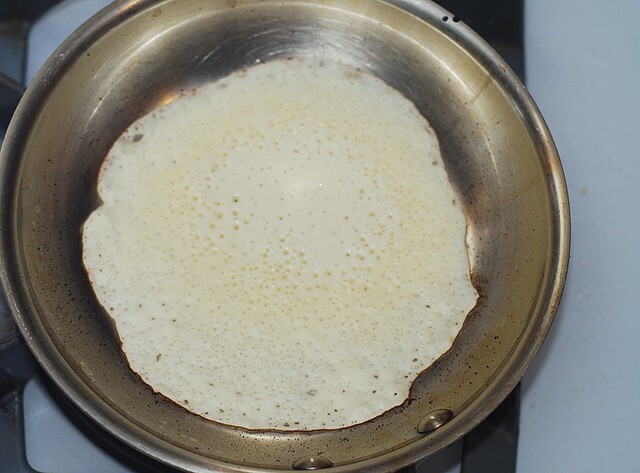 The below crepe batter recipe and tutorial describe how to make crepe batter from scratch, without lumps, how to get just the right batter thickness. 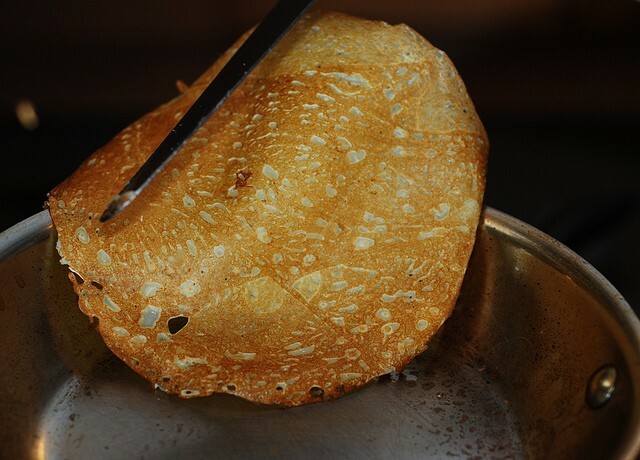 For crepes, the less thick the batter is, the better. 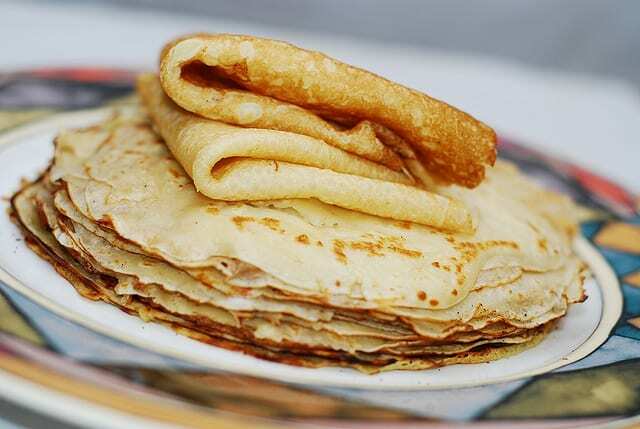 If the batter is not thick enough, though, you will end up with crepes that will be very hard to flip to the other side – they will be too thin. 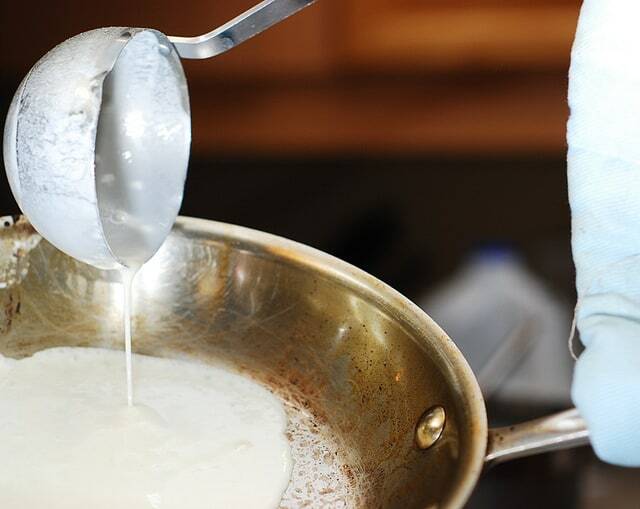 So, it’s a fine balance: just how thick the crepe batter should be. 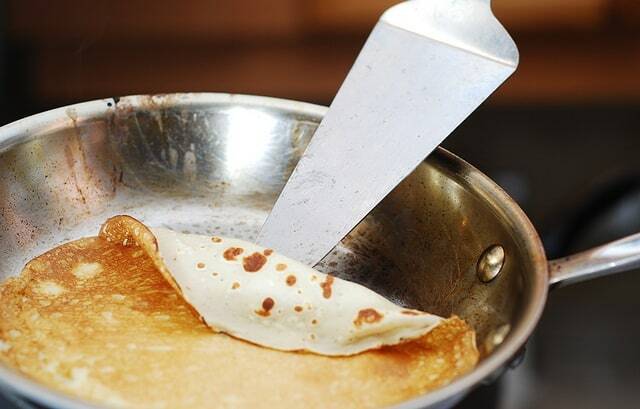 Below I provide precise measurements that I use for my easy crepe recipe that always result in amazing crepes that are slightly sweet, soft, easy to flip and easily moldable in various shapes (pockets, tubes, etc., more recipes to come!). One of my most favorite ways to serve crepes as a dessert is crepes with agave-ricotta cheese filling, topped with pears roasted in honey. Enjoy the crepes! So, yes, making crepes in a stainless steel skillet is definitely possible! I’ve been doing it for years. It just takes practice. 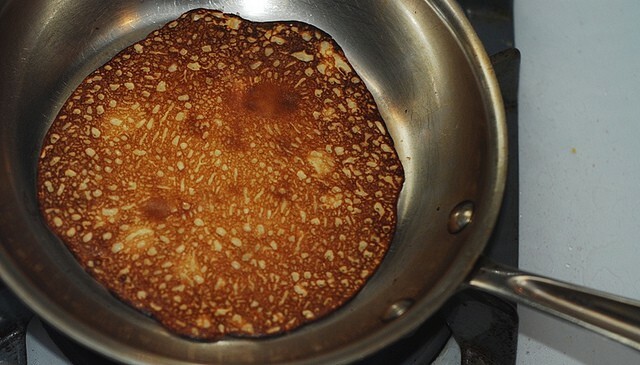 Of course, if you’re new to making crepes, it’s probably easier to stick to non-stick skillets. 🙂 I really hope you find this easy recipe and my instructions for how to make crepes useful! 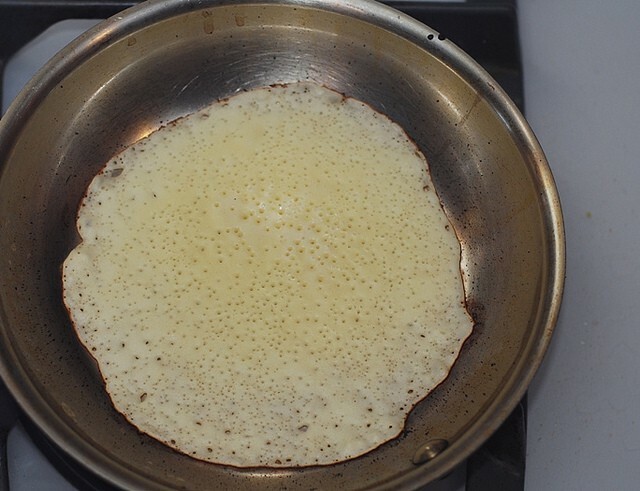 Step-by-step photos and instructions on how to make French-style crepes from scratch in a regular frying pan. 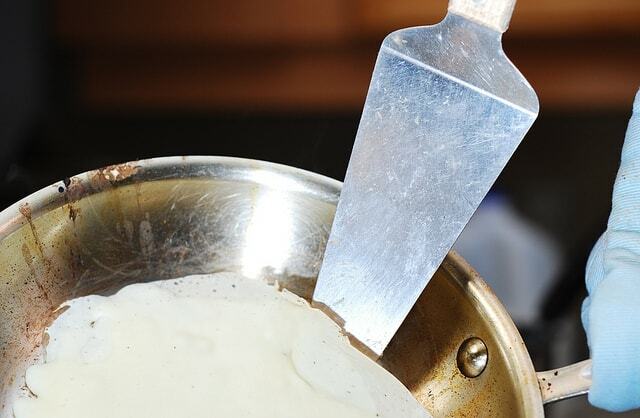 This easy crepe recipe has everything you need: ingredients on how to make crepe batter, step-by-step photos, and detailed instructions for how to flip crepes, how to make sure they don't stick to the pan, etc. 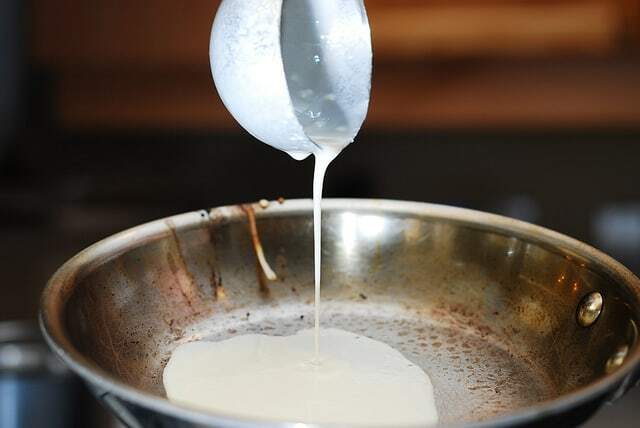 Heat frying pan until very hot (on high heat on stove top), spray it with oil spray and, using a soup ladle, pour small amount of batter into the frying pan as you roll the pan from side to side just enough to cover the bottom of the pan evenly with a thin layer of crepe batter. Depending on the size of your soup ladle, you could use a whole ladle-ful, or less. It also depends on the diameter of your skillet. The key is to cover the bottom of the pan with just a slightly thick layer of batter, don’t coat it too thickly, do it slowly. How to know when it’s time to flip the crepe? 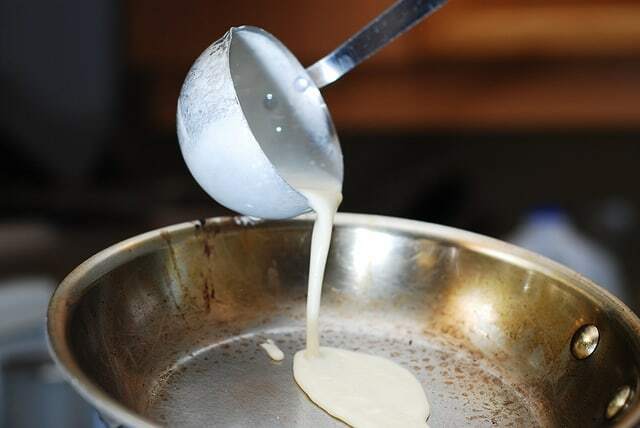 When you first pour the crepe batter, it will be wet in the frying pan but gradually bubbles will be forming and the crepe batter will start to get dry. 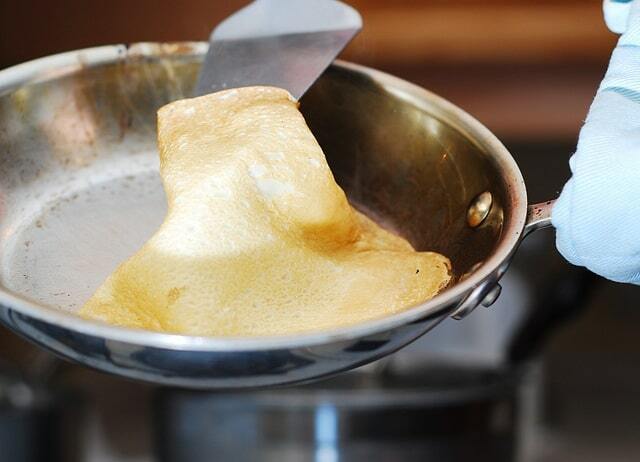 When it’s all bubbles on top and no liquid crepe batter – it’s time to flip! You can see it on my photos above. 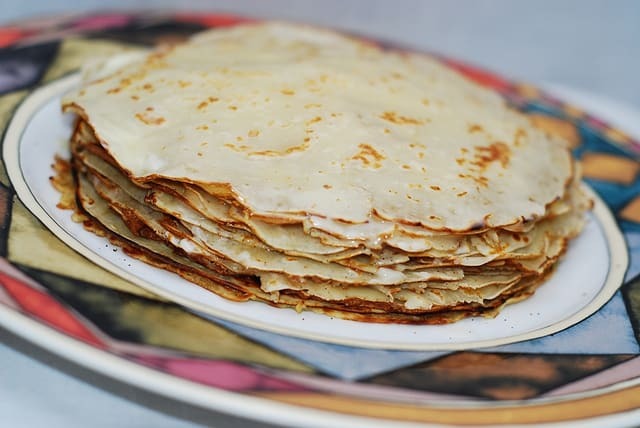 Your subsequent crepes might require much less time to cook, and the more of them you have to make, the faster you will have to flip the crepes, because the frying pan will get more and more heated up. When you cook crepes, your stainless steel skillet is always on high heat. This will minimize sticking. If you use non-stick, you can keep it on medium heat. 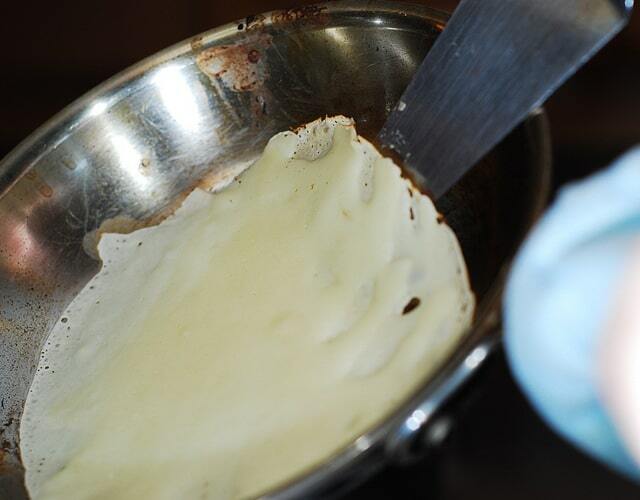 As each crepe gets done, transfer it to the plate and add each new crepe on top of previous crepe in the stack. Sometimes I like to brush each crepe with softened butter and then top it with the next one. It tastes really good, and also helps crepes not stick to one another. Thank you! What a great idea to make these for Valentine’s Day! The recipe is much like the one my mother -in-law gave me, it was a little too sweet, so I like yours much better. I like the crepes a little burnt, they are great. Tank you.